As a natural powder, the black, extremely dull and not so attractive activated charcoal powder is anything but gorgeous. Not many happen to be aware that this completely natural powder comes with an array of benefits for the skin, hair and health in general. It happens to be made of activated carbon that is obtained by the heating up of carbon in a particular way that it develops pores in between for capturing the chemicals. It is made by heating saw dust or coconut shells. Being free from any kind of chemical components, this amazing powder makes for a completely natural product. The charcoal powder for the skin has innumerable benefits as attached under its name. Although rubbing the not so attractive charcoal powder might not seem glamorous at all, but it comes with a plethora of beauty benefits. The charcoal powder happens to be considered as an excellent beauty ingredient that is known to work wonders for the skin. This makes for a 100% Organic powder with no added chemicals, harsh metals or any kind of synthetic additives to be precise. Natural Scrub: The activated charcoal powder is known for its natural exfoliation benefits. Owing to its slightly gritty texture, it helps exfoliates the skin in an all-round manner along with other added benefits. Works Wonders For Oily Skin: The all natural charcoal powder functions as the ultimate remedy against the different woes associated with that of oily skin. Combats Skin Damage: With its absorbent qualities, Charcoal powder helps combat the harmful effects of the skin damaging radicals that come in the name of U.V rays, pollutants and other impurities that lead to substantial skin damage that is encountered on a regular basis. Helps Soothe Bug Bites And Irritations: Charcoal powder helps to soothe any bug bites, insect bites for the matter. It relieves one of skin irritations by reducing inflammations, infections and related issues for the matter. 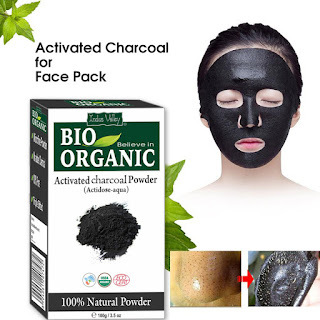 Treats Acne And Blackheads: The activated charcoal powder is known for its powerful soothing and exfoliating properties that help to remove blackheads, acnes and other breakouts in an effective manner while preventing breakouts in the most natural manner. Removes Scars, Marks and Blemishes: With its essential goodness, the Charcoal powder comes with natural properties that helps exfoliate in a brilliant manner while doing away with marks, blemishes, spots and marks for the matter that helps give one a clearer complexion while adding to the beauty quotient in a natural way. Suitable On All Skin Kinds: Owing to its completely organic essence, the charcoal powder makes for an all natural and pure powder that is suitable for application on all skin kinds to put it precisely. The charcoal powder can be used in two different ways for the skin. Either one can use it as a face or skin pack or it can be used as a scrub. No matter whichever way it gets used, the beneficial powder is sure to make the skin feel cleaner, softer and refreshed in an all natural way. Combine all the ingredients as mentioned till you get a smooth paste. For maximum benefits, it is better to apply the mask on clean skin. Apply the mixture on the skin and face as per individual requirements. Leave it at least for 15-20 minutes. Wash it off thoroughly with water and pat dry. Combine all the ingredients as mentioned above in a bowl and shake well till you get a mixture that looks like black sand. Take some amount of the mixture as required and gently scrub the skin and face for 10 minutes. Rinse it off thoroughly with a warm washcloth. Take your pick with the activated charcoal powder for the skin that helps yield smoother, softer and clearer complexion with that perfect doze of radiance.